Sunday, July 27th was a day at Music@Menlo with unprecedented highs and lows. 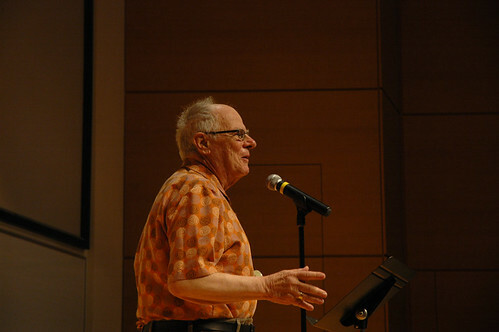 In the early morning, we learned of the passing of our beloved Michael Steinberg, a fixture at the festival since 2004. His Encounters are already the stuff of legend, and his enormous contributions as coach, counselor, lecturer, and poetry reading leader are beyond measure. Read David’s tribute at the end of this blog entry, and look at the Music@Menlo website for a beautiful appreciation by Patrick Castillo. Earlier in the week, composer and educator Bruce Adolphe arrived for a brief visit, including a master class in Stent Family Hall. Bruce brings to his chamber music coaching the unique perspective of composer, and his comments are always well beyond the technical and into the conceptual. The students, and all those present, learned from him on the highest level, all of us expanding our musical imaginations. 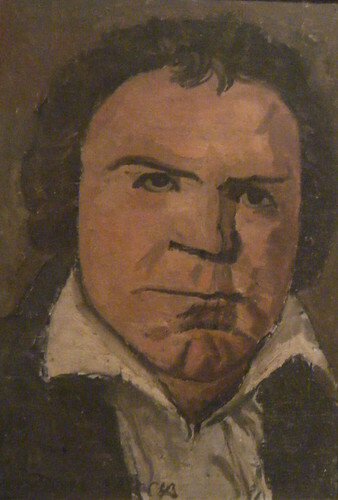 Later in the evening, Bruce delivered his Encounter, which focused on the music of Mendelssohn’s mid-teenage years, during which he composed his famous Octet. Bruce delved into Mendelssohn’s magical musical depictions of fairies, the night, and the sounds of nature in a compelling lecture that included recorded sounds of flies and bees, and a brilliant harmonic analysis of the Midsummer Night’s Dream overture. 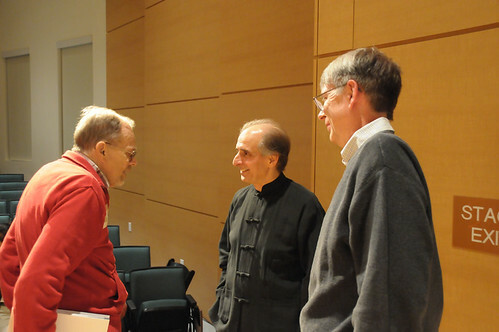 After the lecture, he was greeted by the next Encounter Leader, R. Larry Todd (right) and descendent of Fanny Mendelssohn Thomas Leo (left). 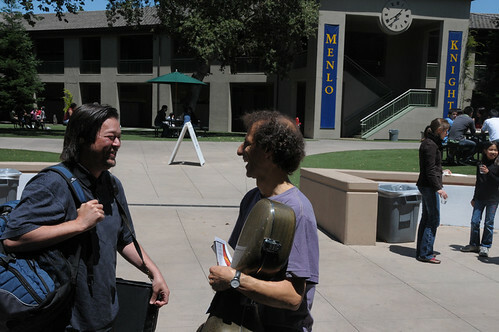 The week was filled with the exciting arrivals of many musicians, including long-time friends violinist Joseph Swensen (left) and cellist Colin Carr. Colin performed a marathon program yesterday of the complete music for cello and piano of Mendelssohn, Schumann and Brahms, with Thomas Sauer. Joey Swensen plays the Schumann Trio tonight with pianist Jeffrey Kahane and cellist Paul Watkins, making his Music@Menlo debut. 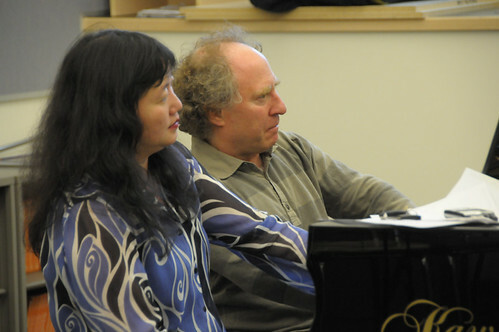 Wu Han and Jeffrey Kahane rehearse for tonight’s two-piano version of Mendelssohn’s Midsummer Night’s dream music. The passing of Michael Steinberg on Sunday morning was not the only tragedy that befell the festival this week. On Wednesday, St. Lawrence Quartet cellist Chris Costanza received a call that his mother-in-law had suddenly passed away, without warning. We sent Chris off to take care of his family, and I filled in for him in the Mendelssohn Octet. 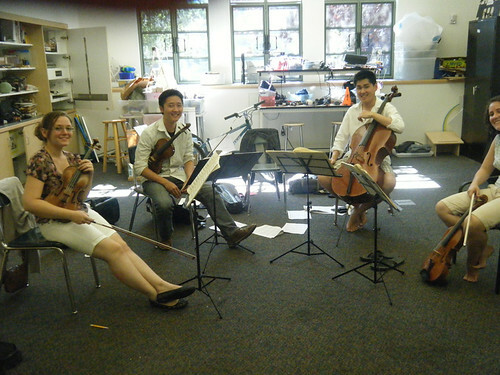 The Pacifica Quartet graciously agreed to play Beethoven’s Op. 18 No. 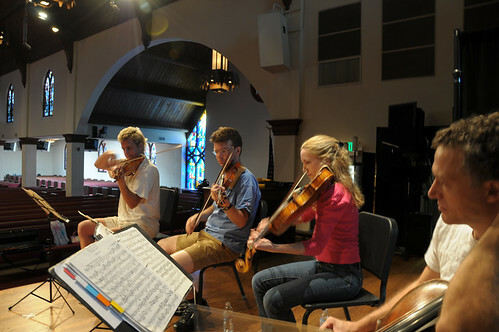 6 for the St. Lawrence, and Pacifica cellist Brandon Vamos filled in for Chris in the Mendelssohn Sextet. Extraordinary generosity of spirit, coupled with stunning talent and valuable experience, brought the concert off successfully in a packed Menlo Park Presbyterian Church. 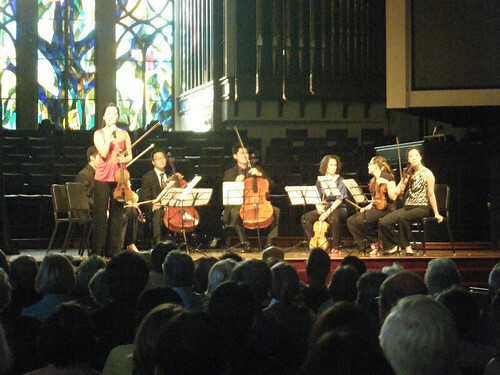 Before the Mendelssohn Octet program, the International Performers gave a dazzling performance of Spohr’s Octet for strings, which is credited for inspiring the octet from Mendelssohn. Before the Spohr, clarinetist Romie de Guise-Langlois entranced the crowd with a work for solo clarinet by the contemporary American composer Libby Larsen. 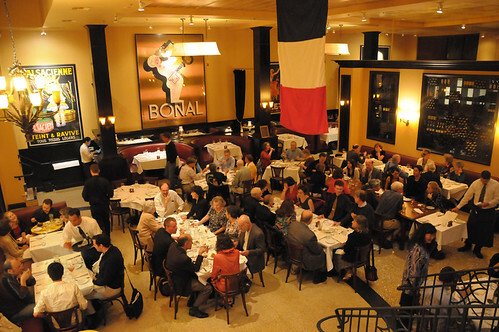 In a wonderful new arrangement with one of the Peninsula’s finest restaurants, Music@Menlo audience and patrons gathered in Menlo Park’s Left Bank Brasserie for a post concert dinner with the artists. The restaurant stays open late especially for selected festival concerts, and a good meal was enjoyed by all. It’s not easy to describe Michael’s effect on audiences and musicians to those who never experienced him in person. It requires a kind of suspension of disbelief, and a faith in the supernatural, in magic, and in the impossible. Michael knew and understood his subjects – the composers, their music and their lives and times – in a kind of depth that made you feel that Michael himself was actually from those times, knew the composers personally, lived in their communities, spoke their languages, and experienced first-hand the challenges and opportunities of their eras. So convincing was Michael’s familiarity with the composer Schubert, for example, that it seemed more believable that he had time-traveled to us from 19th century Vienna. Perhaps he was just stopping in to bring us a report of a new work of Schubert that he had just heard, and would soon return to attend the next Schubertiade, check in on the crazy Beethoven, and perhaps hear gossip of the musical miracles of the young Mendelssohn. Michael’s teaching transcended the word itself, because you didn’t have to listen, analyze, digest or memorize. While it was impossible to learn all of his knowledge, you could absorb his perspective, and come away from his lectures, coachings or even conversations with a deep sense of the material at hand. This was of incalculable value for our youngest students here at Music@Menlo, as Michael so naturally opened their eyes and ears to the endless wonders and mysteries of the world’s most intangible art. No one whose soul was enriched by Michael will ever forget him, or will cease to remain thankful for having lived in his time. We will all treasure the memory of his assured, mesmerizing voice leading us on some of the most fascinating explorations of our lives, and along the way, introducing us to his friends, the greatest thinkers and artists of the human race. He shared not only his knowledge but gave of himself in the fullest measure; his work and life were one, a rich existence to be admired and emulated. While we are in the midst of this summer’s Being Mendelssohn festival, it seems now just as fitting that we expand the our mission to include Being Michael. There’s much work to be done, and so much to be gained. We owe it to Michael to pick up where he left off, to keep his fire burning brightly. That we will do, to the best of our ability, always remembering the incredible source of our inspiration with much love. Bow clicks in the middle of phrases can be as important as at the beginning of notes. 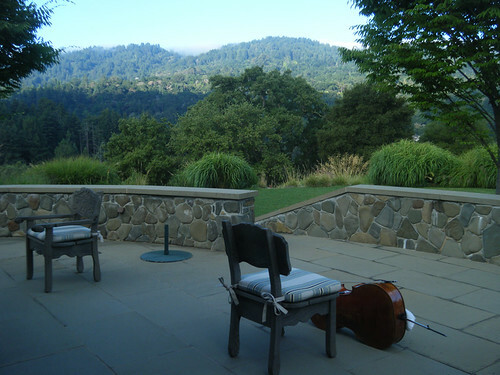 Music@Menlo days begin early for David and Wu Han in beautiful Woodside, CA, where David practices as the sun rises, the fog lifts, and the rabbits listen. The first concert program of the festival turned out to be more of a revelation than I had ever imagined. How often does one hear an entire first half of fugues by three different composers – especially three composers who lived within the same 100 years, who are regarded universally as some of the greatest musicians in history, and who each brought his art to perfection in a different stylistic age? Light moments during the Mendelssohn Sextet rehearsals in Stent Hall, in front of Theo Noll’s paintings. The selections from Bach’s Art of the Fugue showed the tip of the iceberg that is Bach’s unparalleled fugal output. Each employed the techniques of fugal composition for which he is so well known: inversion, dimunition, augmentation, embellishment, etc, all the while offering endless possibilities for interpretation. Hearing his massive fugue in 6 voices from the Musical Offering immediately after, our ears had been prepared to listen to simultaneous lines in a way that is rarely afforded to audiences. 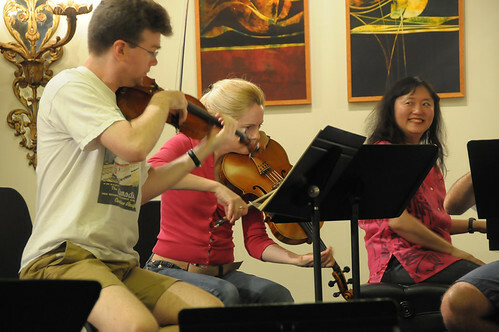 Mendelssohn Sextet rehearsal: Scott St. John, Leslie Robertson, Wu Han. Following the Bach, Mozart’s Adagio and Fugue for quartet and bass seemed almost ridiculously complex, dissonant and jarring. I found myself actually wondering if the group had gotten lost, so convoluted is the writing: one almost completely loses a sense of key, or of where the downbeats are. Was Mozart being serious, or was he perhaps poking fun at a form which had already become outdated? The Mendelssohn String Symphony in c minor, including the St. Lawrence Quartet augmented by International Performers in St. Mark’s Church. But the following fugue, from the pen of the 14-year old Mendelssohn, took hold of the room in a compelling way. It showed the inspiration the form had provided for the young, energetic student who was trained to revere Bach, and to carry his legacy forward. All in all, the first half was a stirring journey that left the ears in a heightened, rarified state. 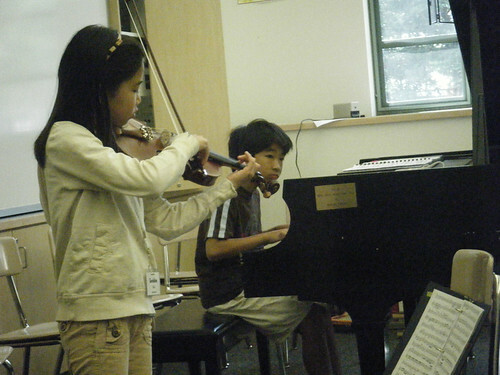 An amazing Mozart sonata in preparation by two Young Performers, both playing from memory. And then, the second half changed musical worlds completely, the young Mendelssohn, only a one year older, composing a work that looks directly to the Romantic age in the style of Weber, but still possessing the beauty of Mozart, the virtuosity of Hummel, and the fire of youth that is uniquely theirs. The heavenly slow movement, in the ethereal key of F-sharp major, was a balm for the ears, especially after the astringent fugal harmonies produced by Mozart. The sheer exhilaration that audience and performers alike experience when notes are blazing by is one of the great thrills that classical music can produce. It’s still great music, but there’s much to be said for virtuosity for its own sake: I play this fast because I can! 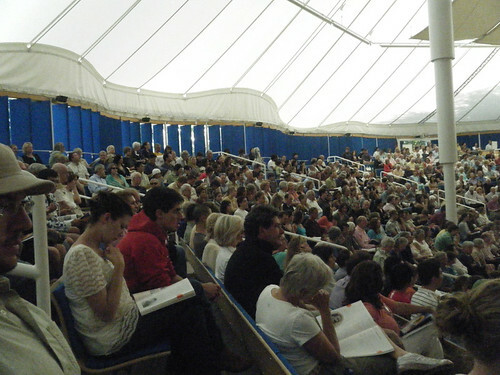 As expected, tumultuous buildup to the end drove the audience into a frenzy, undoubtedly what Mendelssohn had in mind. International Performers Sean Lee, Kristin Lee, Jordan Han. Tonight the next phase of the festival begins, as the Pacifica Quartet starts their traversal of the complete Mendelssohn Quartets. The intrepid IP’s (International Performers) have been appearing now for six nights in a row, performing Schumann’s Fairy Tales, the Mendelssohn c minor Piano Quartet, and the Mozart Clarinet Quintet. 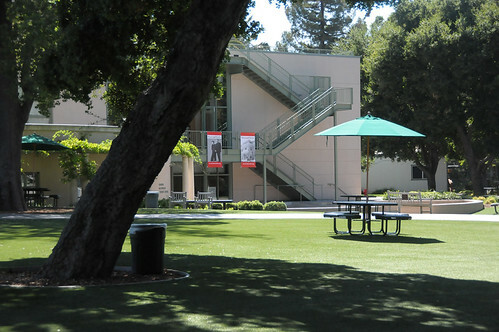 On a perfect summer afternoon, the campus of Menlo School is ready for the 7th edition of Music@Menlo: Being Mendelssohn. In the several days prior to Opening Night, staff, students and performers met, rehearsed and worked in concert in a steady crescendo towards Orli Shaham’s Encounter on Friday evening. 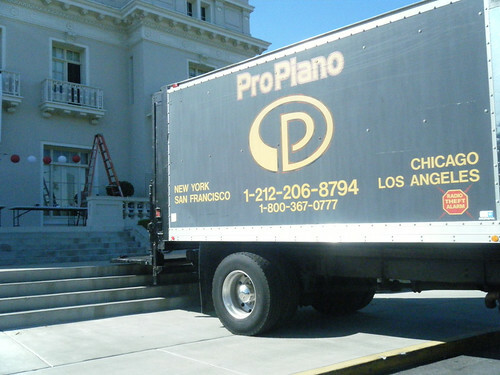 On arrival, my first sight was two ProPiano trucks unloading the festival’s precious Hamburg concert grands. 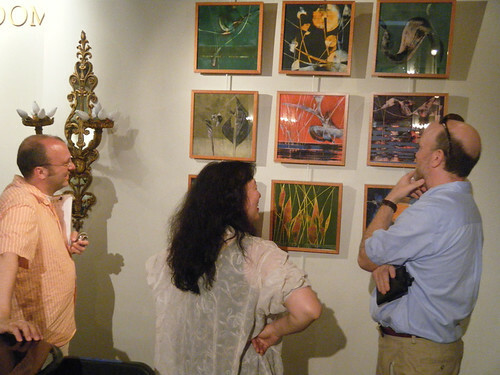 At long last, my good friend, painter and Music@Menlo 2009 Visual Artist Theo Noll (left) arrived in San Francisco from his native Germany to take up residence at the festival, bringing with him two dozen gorgeous paintings for display in Stent Hall. He’ll be interviewed at the Cafe Conversation on Open House Saturday, July 25th. I discovered Theo’s work in a "Kunstmarkt" in Berlin several years ago and have looked forward to bringing him and his work to our projects ever since. 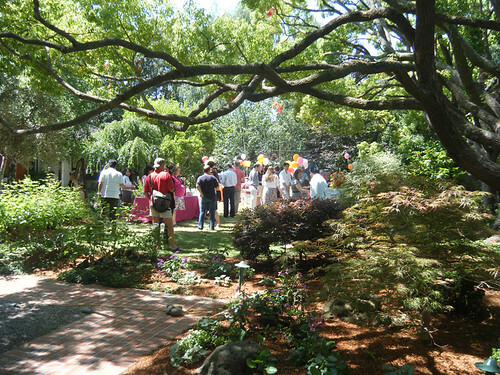 A hearty brunch, hosted by Fran Eastman and Ed Goodstein in their front yard, welcomed the festival’s interns. 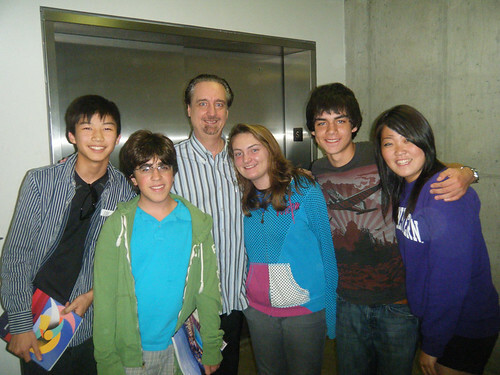 The Goodstein Foundation has supported Music@Menlo’s intern program since the beginning. 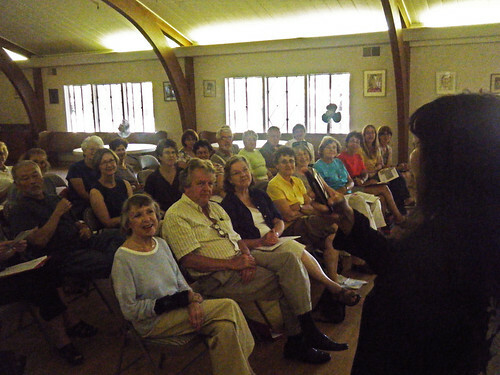 Wu Han welcomed, thanked, encouraged and inspired our many invaluable volunteers at a meeting in St. Mark’s church. 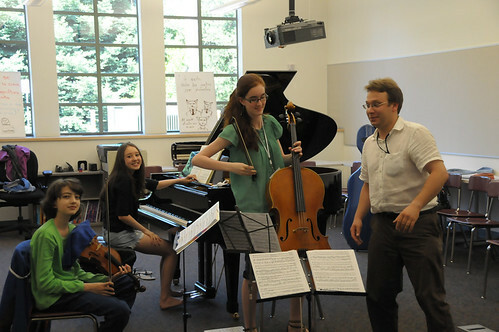 The Young Performers program is for high-school age music students. 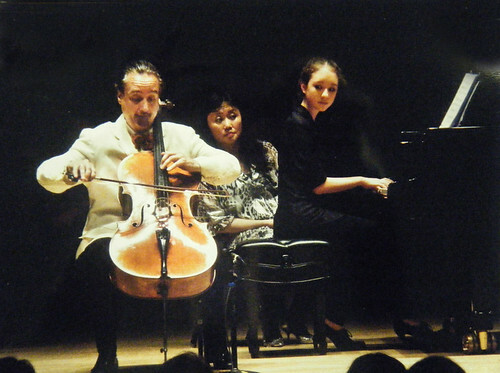 They come from all over the world, and here a trio is coached by last year’s IP cellist Dmitri Atapine, who returns this year as an Institute faculty member. A group of our senior students, the LK Quartet, about to receive a coaching from me on Beethoven’s Opus 18 No. 1. They look happy now, don’t they? 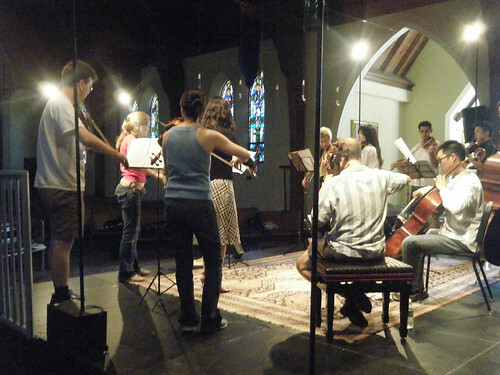 Rehearsals for concert program one wound up with a dress rehearsal and taping of Mendelssohn’s Sinfonie in c minor at St. Mark’s, a French Overture-fugal work composed at the age of 14. 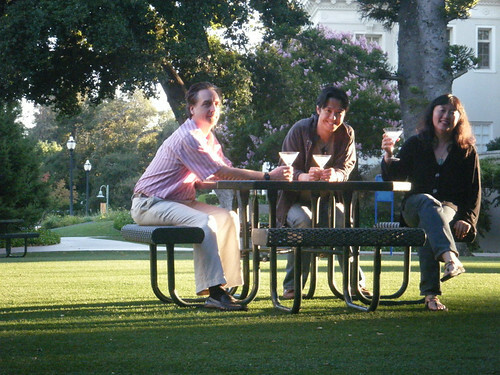 In spare moments during our quick-paced days, we have some fun as well. Recording producer Da-Hong Seetoo gets his first lesson on the iPhone’s ocarina application. After 11 months of preparation, it’s time to celebrate the birth of another festival with Music@Menlo’s incomparable Patrick Castillo, the voice and author of AudioNotes, author of the festival’s program notes, and Artistic Administrator. Real articulation comes from “bow clicks”. Find out what they are and how to make them. 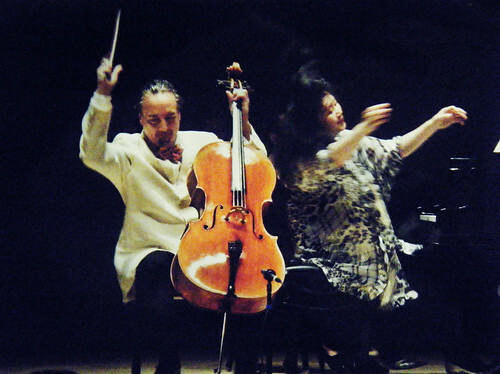 David and Wu Han’s past appearances as chamber musicians, soloists with orchestra, and as a duo at the Aspen Music Festival outnumber their performances in any other venue. 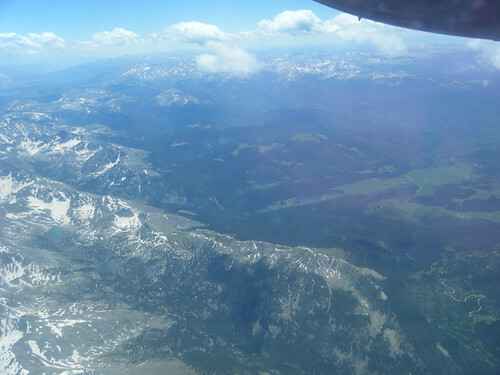 This June and July, the duo took up residence at the famed Colorado mountain festival for a recital, chamber collaborations, teaching and listening to great music. 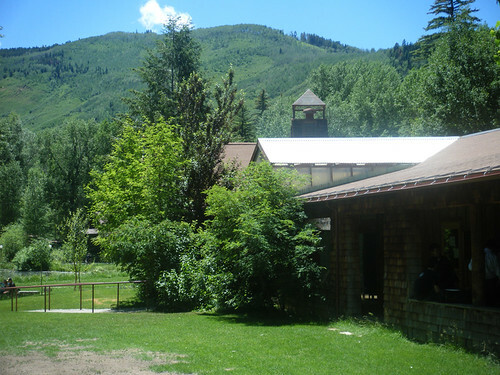 The Aspen Music Festival and School is an institution without parallel in a variety of extraordinary ways. 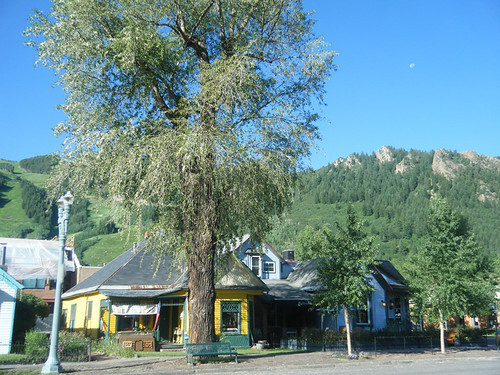 Its location in the most beautiful spot in the Colorado Rockies provides a refuge from the oppressive city summers most of us dread: the temperature drops into the 40’s at night, the air is crisp with a hint of wood smoke, the stars twinkle, and bears prowl the alleys for loose garbage can lids! At the convocation which Wu Han attended (as a piano faculty member this season), president and CEO Alan Fletcher acknowledged long-standing music faculty, revealing that I was returning for my 26th summer. 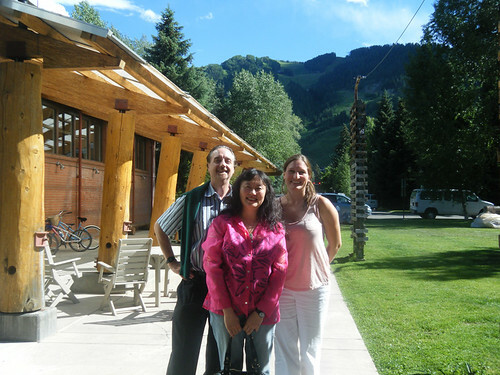 The Emerson Quartet counts Aspen as one of its first summer festivals, and Wu Han as well, when she came here to study with Lilian Kallir in the early 1980’s. 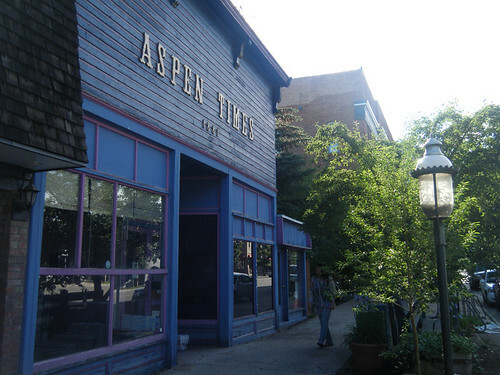 Today, the Aspen Music Festival is nearing its 60th anniversary, presenting over 350 events in nine weeks. 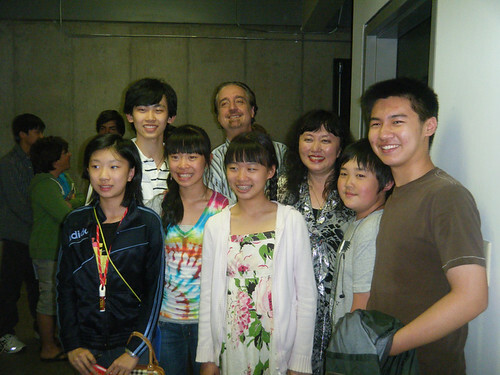 The hundreds of students at the School – who study with hundreds of resident and visiting faculty – participate in five orchestras and attend countless performances and master classes free of additional charge. Arriving on July 9th directly from Buenos Aires, I plunged directly into the festival routine: attending concerts, appearing on Aspen Public Radio interviewed by Nikki Boxer, and meeting up with an astounding array of musicians in residence: violinists Cho-Liang Lin, Gil Shaham, Adele Anthony, Alex Kerr, and pianists Vladimir Feltsman, Anton Nel, Jeffrey Kahane, and Inon Barnatan, and the Takacs Quartet, to name a few. 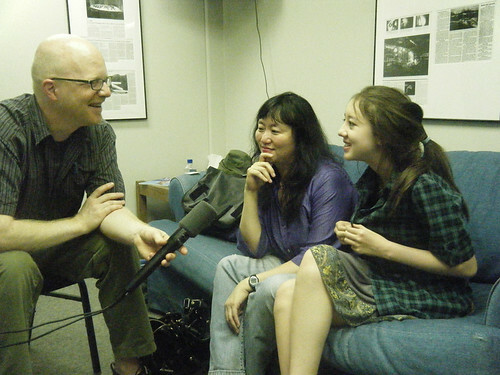 American Public Media radio personality Fred Child, today’s most widely-heard classical music commentator, interviewed our entire family prior to the recital, for broadcast on APM’s Performance Today. Our obligations concluded on July 11th with a recital in Harris Concert Hall, which was completely sold out and packed with students, surrounding us on stage seats. After the opening Mendelssohn D major Sonata, we gave the Aspen premiere of George Tsontakis’s “Mirror Images”, composed for us, and concluded with the Rachmaninov. 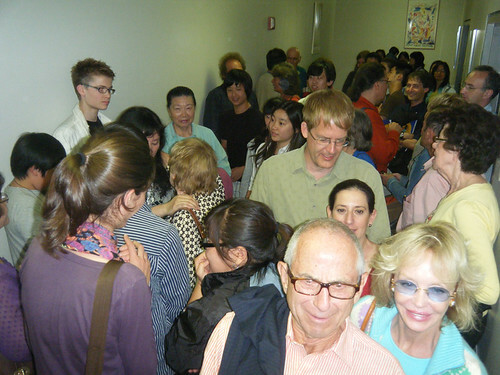 After the concert, we were inundated with students and colleagues, donors and general public. We concluded our visit on Sunday afternoon by listening to a performance by the Aspen Festival Orchestra, conducted by Music Director David Zinman, which included John Harbison’s 5th Symphony, and the Tchaikovsky Violin Concerto played by Gil Shaham, in one of the most astounding performances we have ever heard of anything. Gil absolutely outdid himself, eliciting unanimous amazement and admiration from orchestra and audience alike. This tour was, on all accounts, one of the most enjoyable and successful of our career. We were cared for with great personal attention and foresight in every country; we played to full, enthusiastic houses; we met extraordinary people of different generations who keep classical music coming to their cities; we played in distinguished concert halls with fascinating histories; we learned about historic musical organizations which have brought the most important international artists for repeated visits, and have organized creative festivals, hosted competitions, and commissioned contemporary works. At the same time, I also recognized that South America, or at least what I saw of it, is a region whose potential for chamber music is not yet realized. The audiences loved our performances and cheered wildly; yet, we were often the only string quartet or even chamber ensemble on a whole year’s series. 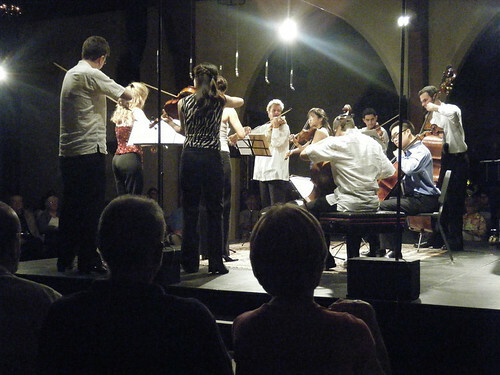 We also learned that unlike North America or Europe, such thing as a quartet that can exist solely on quartet playing does not exist; all members of established ensembles find their major means of support from orchestra playing, and there is not much touring within countries or to neighboring countries. More support for chamber music series in a variety of places, and for chamber musicians themselves, is definitely needed. 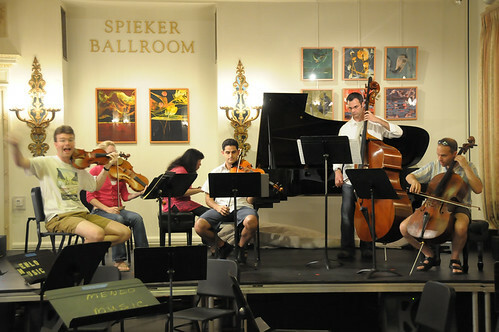 The audiences we played for should not have to wait for expensive stars like the Emerson to come to hear quality chamber music performances. My personal dream, as I leave Buenos Aires, would be to return sometime soon to bring a series of connected programs to the major cities, which would not only highlight the performers but generate high interest in the music itself, and demonstrate the sustaining power of the chamber music genre. Perhaps festivals could be created where chamber music would be the focus; perhaps concert societies concentrating solely on chamber music would be helpful. 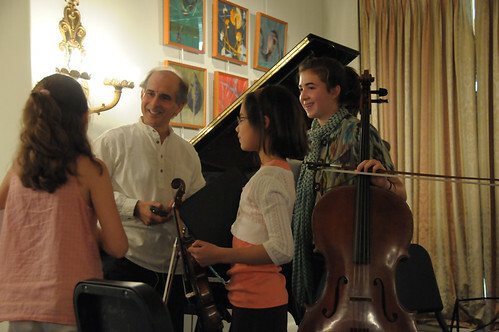 I would be very interested to do some teaching as well, and to connect (as we did only briefly) with the many young musicians who came to our concerts. We also did not get a sense of what is happening in contemporary music in the various countries. I’m sure I speak for my colleagues in the quartet as well when I say that I would love to become more involved in music in South America, as I know Wu Han will. I hope the invitation to return will come soon, as South America has now become as important and exciting a place for me to perform as any other.